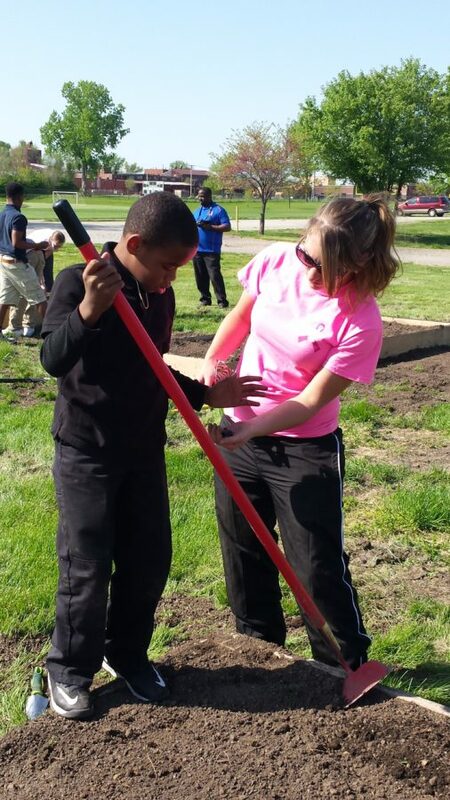 On April 23, 2015, FamilyFarms Charities and the Jackie Joyner Kersee Center in East St. Louis partnered to plant this year’s summer garden at the center. 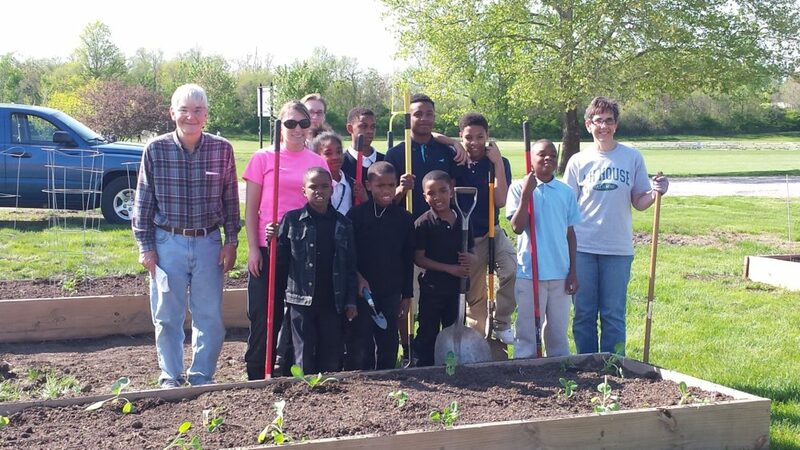 FamilyFarms Charities has worked with the JJK Center on this garden project for three years now, and last year we teamed with Gateway Greening to provide ten 4’x8’ raised beds. This year’s garden includes peppers, tomatoes, sweet corn, broccoli, potatoes, cabbages, squash, zucchini, green beans, peas and onions. 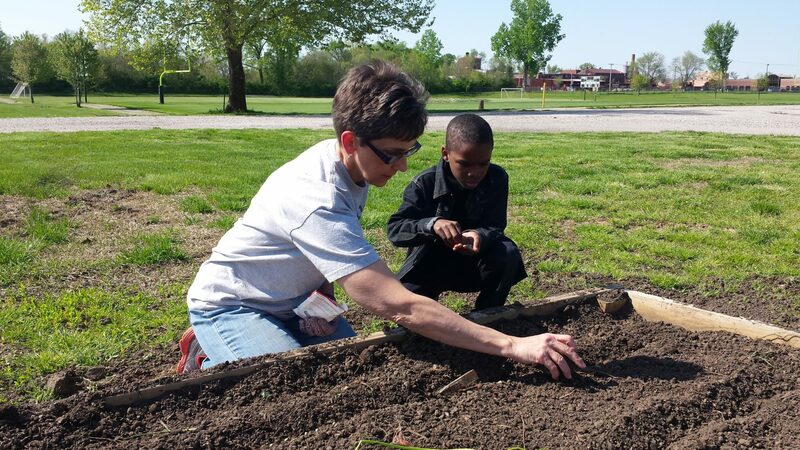 This year, volunteers from FamilyFarms Charities worked with several interested students and staff at the Center to teach them how to plant the garden. 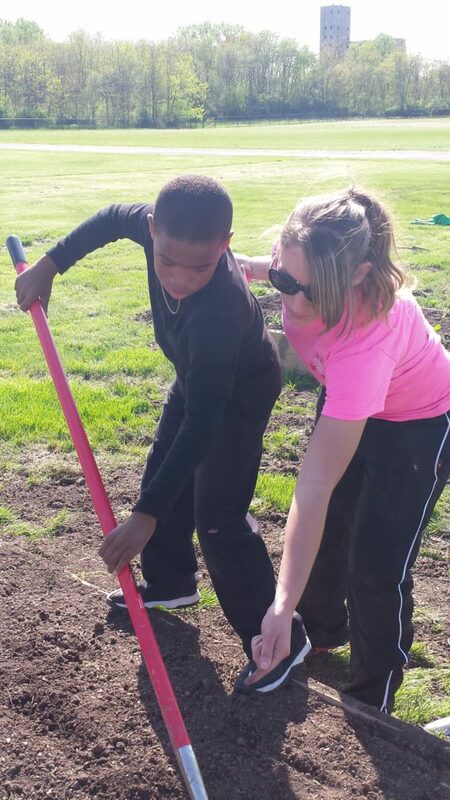 The kids each got to experience planting various kinds of produce so they could see the difference in planting. The kids learned that green beans and corn are planted close together in rows, but plants like tomatoes need more space to grow. 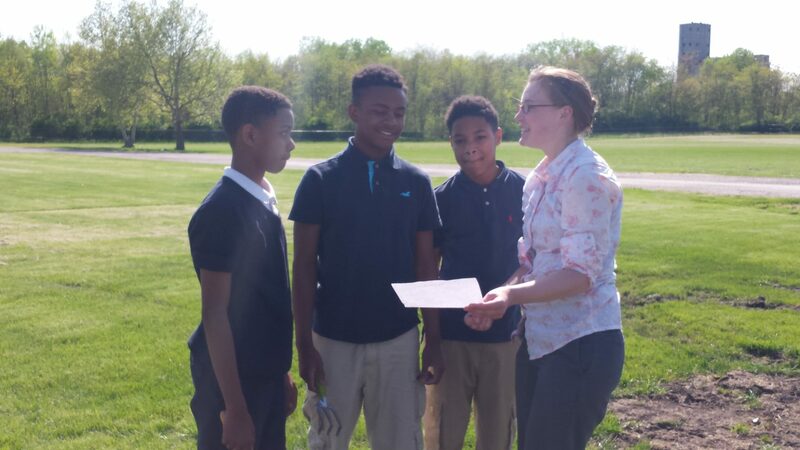 The garden is used as part of the curriculum for the JJK Center Summer Camp. Kids enrolled in the camp work in the garden at least once a week. 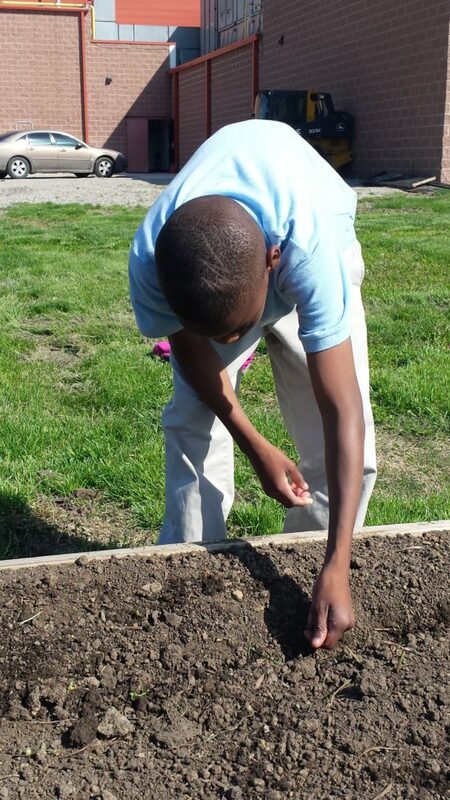 In addition to working in the garden, the kids have the opportunity to learn about agriculture through projects and lessons as part of their Summer Camp curriculum. The JJK Center uses the produce as a part of their hot meals program. The kids get to see the cherry tomatoes growing in the garden, pick them and then those same tomatoes appear in their salads at lunch. 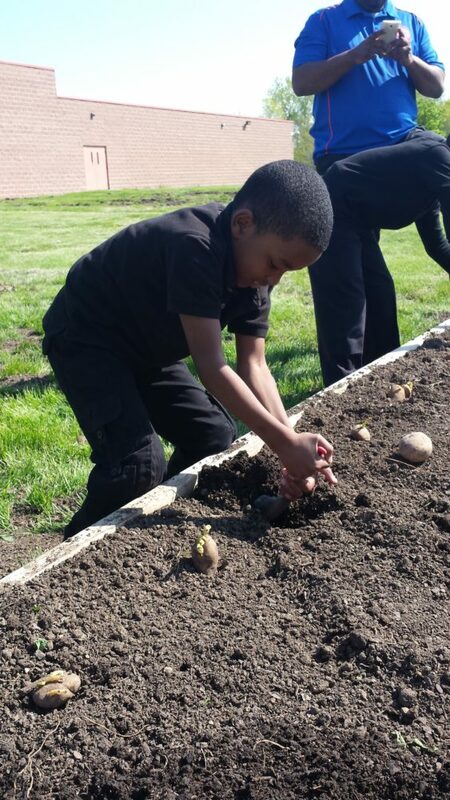 The program provides the kids with hands-on experience as they help plant the seeds, watch the plants grow, tend the plants and do weeding, harvest, and then eat the produce. 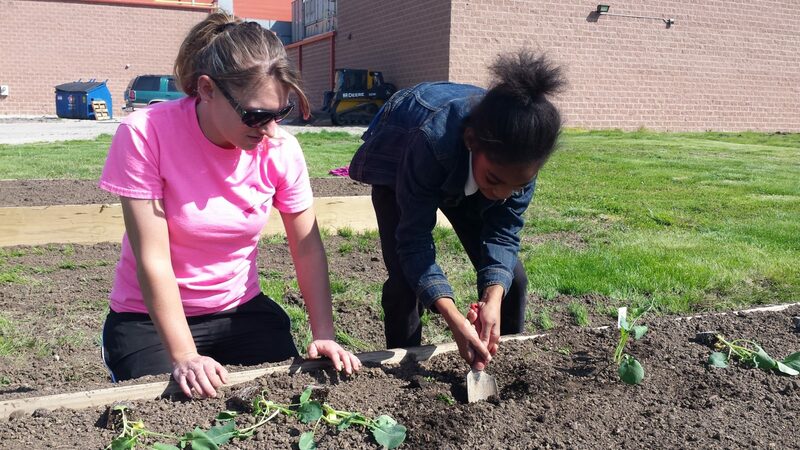 FamilyFarms Charities and the JJK Center plan to continue developing, growing and enhancing this program to educate inner-city kids about the importance of agriculture and nutrition.